• The full, in-depth story of how Vanderbilt captured its first national title. 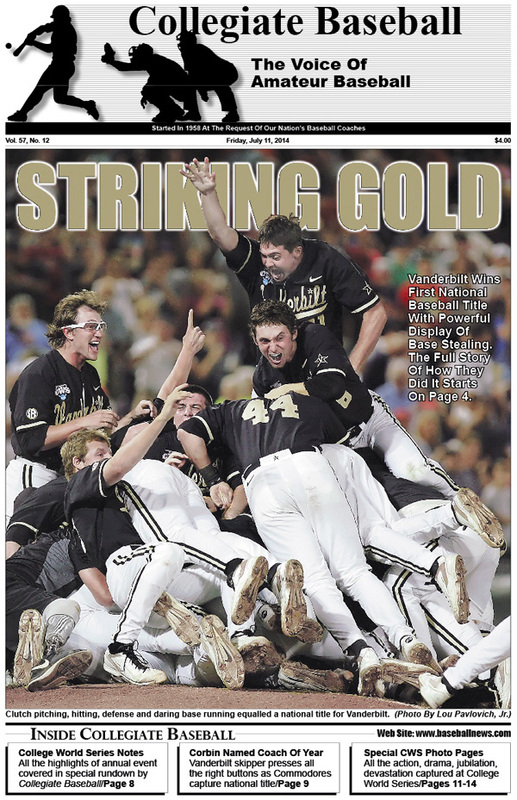 • Four photo pages which capture all the action, drama, jubilation and devastation at the College World Series. • 2014 College World Series notes reveal 16 bats were confiscated prior to start of event. • Box scores of all 16 College World Series games are published. • Turnaround For The Ages: How Tim Corbin (Vanderbilt) and Brian O’Connor (Virginia) turned around programs that struggled for years. • National Coach of The Year: Tim Corbin makes all the right moves in leading Vanderbilt to a national title. • ABCA NCAA D-1 All-Americans: Kentucky LHP/1B A.J. Reed leads the way with staggering statistics. • ABCA NCAA D-2 All-Americans: Colorado Mesa’s Austin Kaiser named National Player of The Year after hitting .478 with 24 doubles, 11 home runs, 61 RBI. • ABCA NCAA D-3 All-Americans: Linfield RHP Chris Haddeland named Player of The Year after posting 11-1 record. • ABCA NAIA All-Americans: Oklahoma Wesleyan’s Jose Ruiz named Player of The Year after leading NAIA in runs scored (82) and RBI (91) while also posting 15 home runs. • California J.C. All-Americans, All-State Teams: Orange Coast SS Cody Nulph named Player of The Year in Southern California while LHP Ben Krauth of Diablo Valley is chosen Pitcher of The Year in Northern California. • NJCAA D-1 All-Americans: Third baseman Eudor Garcia of El Paso C.C. (Texas) named Player of The Year after hitting .460 with 14 home runs, 18 doubles, 3 triples, 63 RBI and scoring team-high 55 runs. • NJCAA D-2 All-Americans: OF Roman Collins of Des Moines Area C.C. (Iowa) named Player of The Year after hitting .435 with 12 home runs, 25 doubles, 3 triples, 75 RBI and 67 runs. • NJCAA D-3 All-Americans: LHP Daniel Brown of Tyler J.C. (Texas) named Player of The Year after posting 10-1 record. • High School Baseball: Lambert High School (Suwanee, Ga.) ranked No. 1 in final Collegiate Baseball National H.S. poll after finishing season with 36-2 record, Georgia state title. Barbe (Lake Charles, La.) and Puyallup (Wash.) are close behind. • ABCA High School All-Americans: SS Nick Gordon of Olympia H.S. (Orlando, Fla.) named Player of The Year after hitting .512 with 11 doubles, 6 homers, 28 RBI and 12 stolen bases..
• Special Pitching Feature: Former Los Angeles Dodger great Don Drysdale explains his thoughts on the all-important area of pitching. • Rick Wolff On How To Deal With Outraged Parents: Well known author gives a 5-step approach on how to deal with parents who go off the deep end and confront coaches. • Charlie Greene Instructional Clinic: Baserunners must always be ready. • Ruleball With Rich Marazzi: How to deal with confusing elements of deflection plays. • Al Figone: Everyone can learn big lessons from Cory Hahn. • Tom Kovic: Victory begins with a dream. • Arizona pitching coach Shaun Cole accepts new position with USA Baseball as director of 18U national program. • Longhorns’ Barrera captures College Home Run Derby. To order the July 11, 2014 edition of Collegiate Baseball or subscribe, CLICK HERE.